Igniting sales. Fueling revenue growth. At BIG IDEA, we define Sales Activation simply as: Providing your sales team with the tools, insights, and information they need to close more sales, more efficiently. This is also a critical and often missed or misconfigured integration between marketing, sales, and technology. 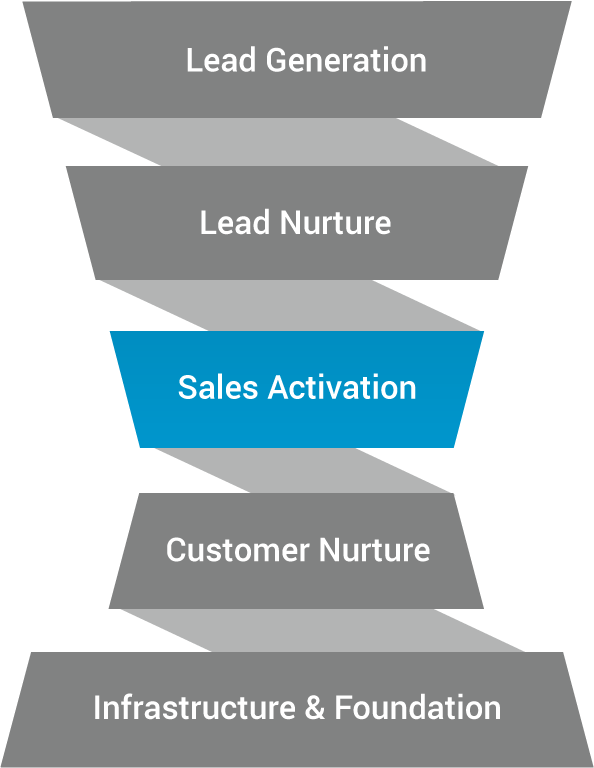 Sales Activation happens at the bottom of the funnel during the Decision Making stage of the buyer’s journey. This is the point where prospects are weighing their choices and deciding if your product or service will solve their problem and/or provide the outcome they desire. This is also the place where deals can stall and sales cycles can drag on if a clear and superior buying option is not presented. Integrated Marketing, Sales, and Technology. A successful Sales Activation program is a strategic, ongoing process that equips business development staff with the tools, methods, insights, and technology they need to provide prospects with the right information at the right time. It’s an integrated platform of Marketing, Sales, and Technology that serves up answers (and sales results), as prospects move forward seeking to solve their problem and/or find the product or service that meets their needs. Growing revenue and customer satisfaction. A top performing Sales Activation program transforms and enhances the way marketing and sales work together to improve conversion rates, increase pipeline velocity, improve lead management processes, and increase visibility and insights at this stage of the buying process. Not only does this increase revenue, it also results in an improved experience for the buyer. 42% of sales reps and business development personnel feel they do not have the right information before making a sales call. Sales Activation solutions from BIG IDEA. At BIG IDEA we understand that every company is at a different point in their Sales Activation journey. And for solutions to succeed, they need to be custom tailored to fit your specific needs. This is why our approach assesses the current situation with the alignment and integration of your marketing and sales. We identify the gaps, unmet needs, and other opportunities within your sales processes and your sales team. This is about more than discovery and recommendations. It’s about creating a common vision and preparing your organization for real transformation. Next, we create an integrated sales activation strategy and timeline that gives your sales people the information, tools and training they need to have engaging, relevant, conversion-focused interactions with your prospects and customers. Then we execute, working with you in a collaborative and flexible way that uses predictive data, market data, and best practices processes to improve everything from revenue generation to creating a tighter and more effective integration between marketing and sales and the buyer’s journey. Predictive Lead Scoring. Focus only on top prospects. Using predictive marketing and sales technology, we score incoming leads in real time so your sales team can focus on the highest priority opportunities. Likewise, we can score leads already in your CRM or database so your sales team can focus on what is most important – moving sales forward with the most qualified prospects. Sales Activation driving revenue growth. Increased sales pipeline conversion rates. Increased deal velocity through the sales pipeline. Improved visibility and performance tracking into the integrated marketing and sales funnel. More effective use of sales resources. Improved buyer experience as prospects move through the buyer’s journey.